Most Venice hotels are old-fashioned Venetian in style, with pastel colours, gilding and grandeur - basically a cheap reproduction of traditional palaces from Venice's glorious heyday. Some of the more expensive recent hotels have converted genuine palaces to temples of bling, where bland international hotel style is overlaid with unconvincing Venetian touches and a few Murano glass chandeliers, with an effect that is both soul-less and tacky. Traditional or fake-Venetian hotels can still be perfectly comfortable places to stay, but it is possible to find accommodation that is more individual or authentic in style. One of my top stylish places to stay is the nine-room boutique hotel Novecento, which has a cosy eclectic style inspired by travel and by the 1900-era bohemian style of Palazzo Fortuny in Venice. On the 'design hotels' page I've picked out some recommended places to stay with a contemporary atmosphere and look. For something unusual - though not precisely comfortable - you could always try sleeping on a boat B&B. As well as its historic architecture, Venice is proud of its modern art credentials. The town has several modern and contemporary art galleries. In odd-numbered years, Venice hosts the huge and prestigious Art Biennale, where art-lovers can wallow in installations and artistic theorising. As well as the national pavilions in the public gardens (Giardini), exhibitions are housed in the vast Arsenale and in interesting historic buildings all around town. > Peggy Guggenheim Collection - Dorsoduro 701 (Fondamenta Venier dei Leoni). Created by the colourful Peggy Guggenheim, this is one of Venice's most visited tourist attractions and is a wide-ranging collection of 20th-century art. > Palazzo Grassi - San Marco 3231 (San Samuele). Contemporary art exhibtions housed in a large building on the other side of the Grand Canal, recognisable by the large, usually surreal, temporary sculptures which decorate the canalside. Palazzo Grassi was bought by the French billionaire businessman François Pinault, who commissioned Japanese architect Tadao Ando to redesign the interiors to house temporary exhibitions. Pinault also beat the Guggenheim Foundation to win permission to develop Punta della Dogana, the old customs complex at the mouth of the Grand Canal. This now houses further exhibitions displaying work from Pinault's own art collection. > Ca'Pesaro - Santa Croce 2070. Venice's civic museum dedicated to modern art contains works from the 19th century onwards, including paintings and sculptures exhibited at the Biennale, and works by important local artists. In even-numbered years, instead of the Art Biennale Venice hosts a large Architecture Biennale, using the Arsenale and Giardini pavilions and exhibition spaces. Away from the exhibitions, you can sample a different Venice by hunting down modern architecture. Naturally, Venice's heritage is protected and listed. This means that new architecture in the city is both rare and controversial. A new and unpopular bridge by Santiago Calatrava, called Ponte della Costituzione, crosses the Grand Canal between transport hubs Piazzale Roma and the railway station and is the first really recent work of architecture that most visitors will see (the most controversial aspects were the glass surface, unsuitable in the wet, and the step-free pods, which never worked). Other architectural highlights include various interiors and small projects by Carlo Scarpa (more below), and a couple of works by Giancarlo de Carlo: a modern housing experiment on the island of Mazzorbo and a seaside development on the Lido. A modern theatre (the Junghans) and residential developments are hidden away on the Giudecca island, and show some interesting attempts to echo traditional features of Venetian architecture. Visitors interested in architecture shouldn't forget to visit the Giardini site of the Biennale, dotted with national pavilions from the last hundred years. Venice's remarkable historic architecture, its canals and its lagoon naturally attract most of the attention of visitors to the city. But for travellers who seek them out, some of Venice's finest treasures and most stylish secrets are tucked away indoors. As well as priceless paintings from Venice's past, the city's museums also house fascinating examples of interior design. Ca' Rezzonico is Venice's museum of the 18th century, and the visitor can stroll through some of the finest interiors viewable by the public. 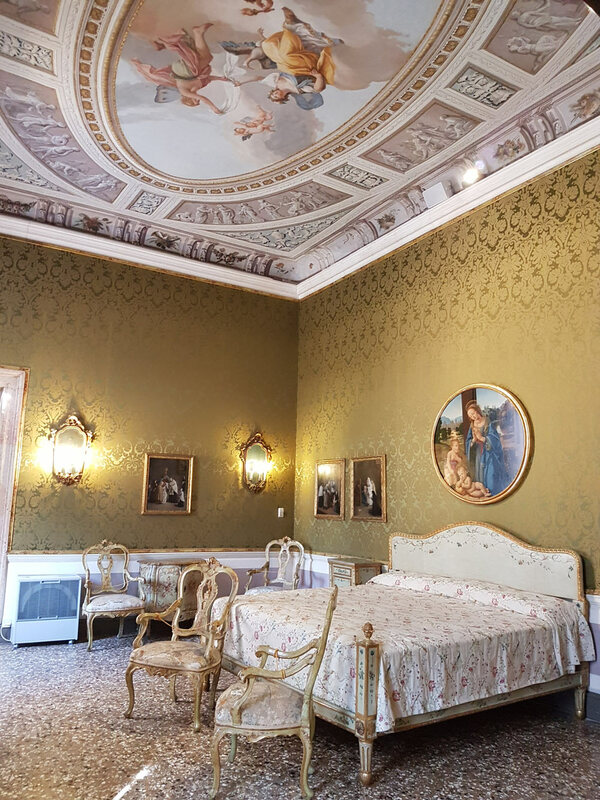 With ceiling frescoes by Tiepolo, Murano glass chandeliers, family portraits, brocade, historic wallpaper and beautiful furniture, this is a step back in time to see how Venice's patricians once lived. Also kept in the museum are the painted decorations from Giandomenico Tiepolo's home, painted by the artist himself and a completely wonderful, fantasy-filled and unique interior. Another typically Venetian patrician palace is open to the public, along with costume and perfume displays, at Palazzo Mocenigo: more frescoes, silk, Murano glass and gilding along with aged glass mirrors and huge paintings celebrating the family's history and achievements. For something a bit different, the Fondazione Querini Stampalia is one of my favourite destinations. After being left by the last heir for public use, this palace at one end of Campo Santa Maria Formosa now contains a library, an art gallery, a cafe-restaurant, historic palace interiors and more. 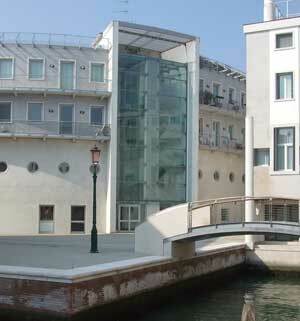 The entrance bridge, ground floor and garden are 'interventions' by 20th-century architect Carlo Scarpa and provide a striking alternative to traditional Venetian buildings, while using varied materials to emphasise the importance of light, water and reflections, those most Venetian of features. Upstairs the piano nobile has more handsome historic interiors in a suite of furnished rooms, along with an art gallery. Admirers of Scarpa's work will find other small projects around Venice, including the modernist Olivetti showroom, open to the public in St Mark's Square (free to UK National Trust members). As well as the 17th and 18th centuries and the Scarpa-era modernism, Venice has reminders of other eras. Palazzo Fortuny, open periodically for exhibitions, was the home and atelier of designer and artist Mariano Fortuny and has, in my opinion, one of the most wonderful interiors in Venice. 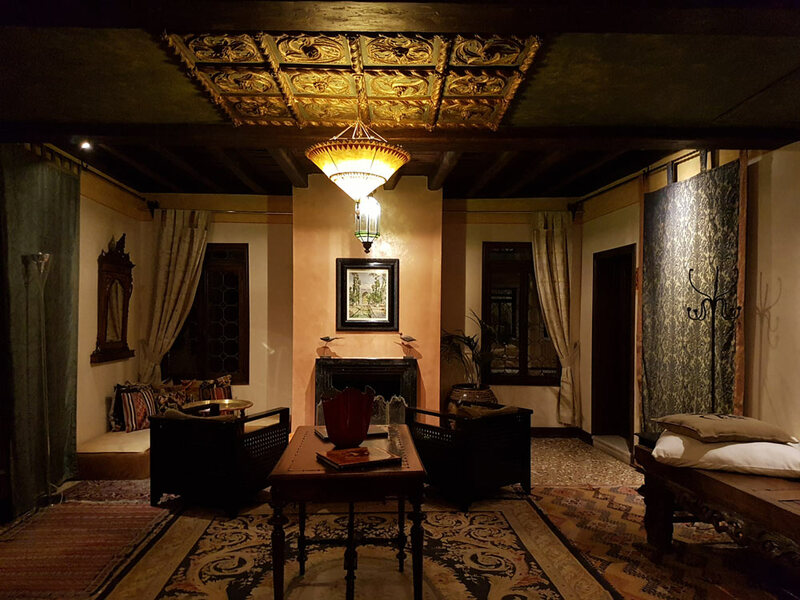 Decorated with a gothic-bohemian eclecticism, the walls of the principal salon are hung with the designer's famous fabrics, and display paintings and objets d'art. Another room is decorated with colourful frescoes painted by Fortuny (who included stage design among his many talents). Venice isn't a trendy city, and the quality of food, drink and service are prized above stylish interiors, so the city's restaurants and bars tend to be small, simple and straightfoward in design. The historic cafes in St Mark's Square, especially Caffe Florian, with its frescoed walls, are good destinations if you want to sit in traditional elegance and don't mind paying steep prices for a hot drink. Near the Piazza, in a Grand Canal palace owned by the Biennale, L'Ombra del Leone is a bar-restaurant with a modern interior and outdoor tables looking over the canal. 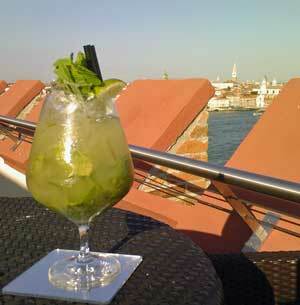 For cocktails at sunset, try the rooftop Hilton Skyline Bar at the Hilton Molino Stucky Hotel on the Giudecca - again, it's expensive, but the view is something quite special. > Helicopter tour - For a very lavish and unusual treat, why not book a helicopter tour to see Venice from above? Helicopter rides depart from the the little airport on the Lido island, between Venice and the sea. You can choose from various different tours, which don't pass right over the heart of Venice, but do offer spectacular views from above the eastern end of town. With this bird's eye view of the lagoon, islands and sea you can really get a good overview of Venice's geography as well as an exciting excursion. Tours cost from around €130 per person and should be pre-booked with Heliair Venice or Fly Venice (see links panel on the right). > Lagoon by boat - A lower-impact kind of sightseeing is a tour in a traditional lagoon sailing boat, a bragozzo. There are various organised excursions in the summer months - check with the tourist information office, or try contacting the website 'Il Bragozzo' (see our links panel), which offers whole and half-day outings, or romantic evening cruises. > Budget cruise - Buy some expensive chocolates at VizioVirtù (Castello 5988) and enjoy them on a night-boat ride down the Grand Canal. 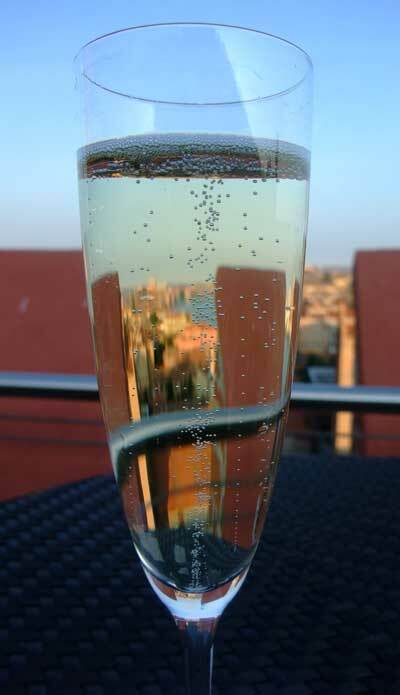 > A meal on the lagoon - In summer, visit the peacock-inhabited island of Le Vignole for lunch by the lagoon at the Trattoria alle Vignole. > A scenic jog - Go for an early-morning jog- run along the waterfront of Riva degli Schiavoni, past the Giardini public park and as far as the green spaces of Sant'Elena. Finally, you probably should fit in a spot of good old-fashioned sightseeing. If you've already seen the big sights, it's worth visiting an out-of-the-ordinary destination like the cemetery island of San Michele or the fishermen-and-farmers' bar on Sant'Erasmo (about as far from hip and modern as you can get, and thus cool in a very postmodern way). One of my favourite places is the Giudecca island, just a ferry-hop over the water from the heart of Venice. Here you'll find modern architecture (see above), wonderfully-positioned benches with views over to St. Mark's, boatyards, a residential vaporetto, real local atmosphere and also the new Hilton hotel with its panoramic rooftop bar (recommended above). Other slightly off-beat destinations in Venice include the eccentric Acqua Alta bookshop, (Castello 5176, Calle Longa Santa Maria Formosa), haphazard home to cats, a gondola and stacks of second-hand books (including local interest and an English-language section) balanced on crates to escape high water.